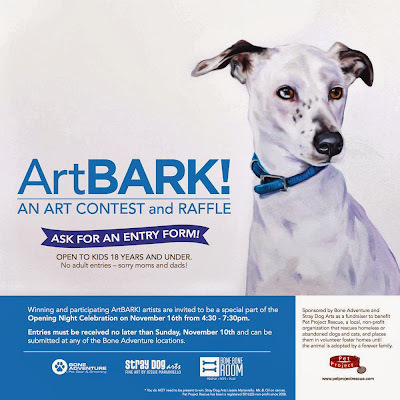 Stray Dog Arts: ArtBARK! :: An Art Contest and Raffle! ArtBARK! :: An Art Contest and Raffle! KIDS!! We want your dog art!!! Get your entry cards at any of the Bone Adventure locations and submit them by November 10th! ArtBARK! is an art contest and raffle in celebration of the connections created between our dogs, our families, our communities and the greater world. Submit an entry to our dog-themed art show and contest, then bring your family by to see all the great dog art! Pet Project Rescue is a local organization that rescues homeless or abandoned dogs and cats while also working to reduce the homeless animal population at its source in Minnesota AND Mexico!! with paintings by yours truly in the "Mi Perro"
gallery exhibition at The Bone Bone Room. Come for the ART. Come for the FUN. Raffle tickets can be purchased at any of the Bone Adventure locations OR at the event for $10/ea! Support Pet Project Rescue AND get a chance to win great prizes for you and your pet from Stray Dog Arts, Bone Adventure, and Metro Dogs Daycare and Boarding! encouraged to be a special part of opening night celebrations! See you at The Bone Bone Room!